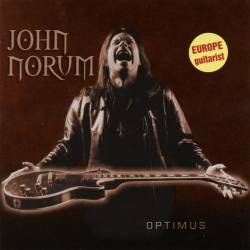 Statistically it must have happened already nearly a dozen times that I wrote a review on the artist's birthday, but as the info sheet is never that accurate about the biographical data, I never noticed before, so Happy Birthday (his 41st) to John Norum. Up until the very late 80s, he was one of the main suspects in provoking the ozone hole and global warming by playing in Europe's most famous hair metal band ever. They were Europe, by the way. Norum left the band at the peak of their success, which up 'til today is still recognised as a sign of integrity, as Europe were becoming more and more commercial. Norum started a solo career with moderate success, but is still around until this year where he rejoined Europe for a critically acclaimed comeback album, but recorded at the same time a new solo album called Optimus (after the street where he grew up), filled with ten hard rock songs in the vein of the late 70s and early 80s classic stuff. John Norum is an excellent singer. He never sounds as effeminate as Joey Tempest did on The Final Countdown, but has a much darker mood to his vocals, reminding me of a young Gary Moore at times. The music is heavier than you could expect, with a bluesy solo guitar dominating a lot of the work, especially the two instrumentals Optimus and Solitude. Apart from that, this is post- or rather pre-stoner with classic blues hard rock, a genre that would be at ease at every beer soaked biker party. Not especially the music I listen to in my leisure time, but I admit that this is done with a lot of conviction, enough to convince every survivor from the 80s that this guy was always more than just a pretty hairdo rock star.